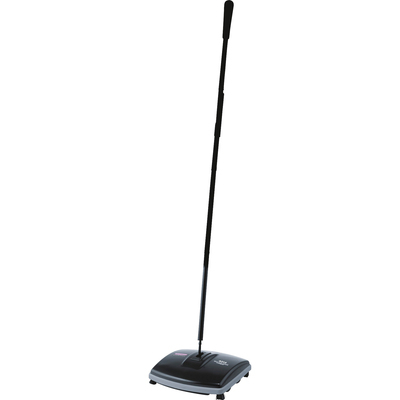 Floor/Carpet Sweeper Has A Small Cleaning End So It Can Reach Tight Spots On Bare Floors Or Low-Pile Carpets. Handle Folds Flat For Easy Access Under Furniture. Design Also Features An Efficient 6-1/2" Sweep Path, Natural Boar Bristles, Bumpers, And An Easy-Open Debris Pan For Effortless Cleaning. Sweeper Is Made Of Durable Galvanized Steel And Tough Abs Plastic..
Floor/Carpet Sweeper Has A Small Cleaning End So It Can Reach Tight Spots On Bare Floors Or Low-Pile Carpets. Handle Folds Flat For Easy Access Under Furniture. Design Also Features An Efficient 6-1/2" Sweep Path, Natural Boar Bristles, Bumpers, And An Easy-Open Debris Pan For Effortless Cleaning. Sweeper Is Made Of Durable Galvanized Steel And Tough Abs Plastic.